Content strategy has seen an interesting evolution of focus — from authoring and publishing smarter to embracing social media and personalization. The Internet of Things adds another layer of complexity: event-triggered communication. Devices and services can (and do) talk to each other in fragments, but at some point information about those interactions need to be organized and communicated in a human-friendly form. Proper localization planning is critical in this model. 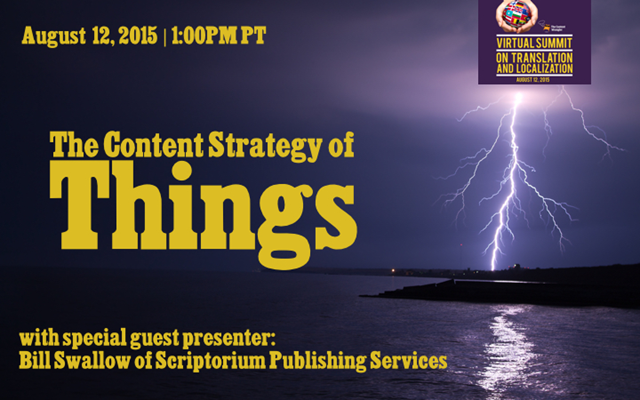 Join Scott Abel, The Content Wrangler, and his special guest, Bill Swallow of Scriptorium Publishing Services, as they look at content development and localization practices for these scenarios.